When you’re looking for getting new and better results in the gym, the name of the game is about consistency. If you don’t go, you’ll have nothing to show. When we go to the gym on a consistent basis, we may start to notice that our results are not coming to us as frequently as when we had started. Eventually, we start going a little more, training a little harder and longer in order to achieve those results we have not accomplished. Eventually, the above quote becomes a mantra that gets into our heads and, eventually, we pay for it – developing a condition known as overtraining. Overtraining occurs when an athlete is training intensely, but, instead of improving, performance deteriorates, even after an extended rest period. The first noticeable difference is in an athlete’s performance, and may extend over a period of weeks or months. Overtraining syndrome (OTS) and exhaustion are a consequence of an imbalance between stress and recovery. Ideally, when an athlete trains, his/her performance should be constantly improving. However, when the adaptations of training develop longer than the initiation of exercise, the body is receiving a repeated bout of physical stress requires recovery, but the body does not recover adequately. Generally, the first indication of impending OTS is a change in mood although it is the decline in performance that usually captures the attention of the athlete, personal trainer and/or coach. Unfortunately, scientists do not have a universal agreement of the diagnostic criteria for OTS. There are a number of hypotheses in the literature, but each explains only one or a couple aspects of OTS. In 2000, Dr. Lucille Lakier Smith published an article describing the potential mechanism of OTS. She proposed that excessive training/competing causes repetitive tissue trauma, either to muscle and/or connective tissue and/or to bony structures, and that this results in chronic inflammation. The traumatized tissue synthesizes a group of inflammatory molecules called cytokines. 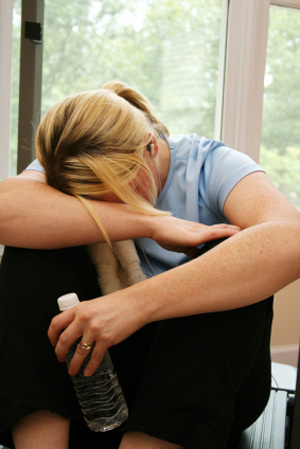 Some of the complaints of OTS are “heavy legs” and general fatigue. The glycogen depleting hypothesis suggests that these symptoms occur as a result of a lack of energy. Therefore, symptoms of OTS should be avoided if enough carbohydrates are eaten to fill muscle energy stores (i.e. muscle glycogen). However, when scientists tried this in cyclists, the cyclists still elicited signs of overreaching (short-term overtraining) and might have met the criteria for overtraining had the subjects been followed for a longer period of time. This hypothesis suggests the general complaints of fatigue (low blood glycogen) may be due to an excess of an amino acid called tryptophan in the brain and spinal cord. This is the same amino acid that is found in turkey and blamed for that “Thanksgiving Coma” we get after eating that big meal. Strenuous exercise may create an increase in a neurotransmitter called serotonin via the extra tryptophan in the blood. This causes lethargy, depresses neural excitability, alters hormonal functions, decreases muscular contractions, and may impair judgment. However, this was demonstrated in rats and has not yet been demonstrated in humans. Also, it does not explain the tendency for infections that typically occurs in OTS. Glutamine is an important amino acid involved in optimal functioning of the immune system. Lower blood glutamine levels have been measured in overtrained athletes. This may be the cause for the increase in infections associated with OTS, however, it does not explain the change in mood or decrease in energy levels when an infection does not occur. The adaptations and performance of exercise is dependent on the intricate links between the central nervous system (the brain and spinal cord) and the endocrine system (the hormonal system). Any changes in either of these will affect performance in the muscle system. The endocrine system in particular controls an intricate group of glands whose hormones are vital to all aspects of life. When overtraining occurs, then there must be a disturbance of some sort with the endocrine system and the factors that control it – namely, the autonomic nervous system (i.e. the sympathetic and parasympathetic nervous systems). The following table compares the signs and symptoms of two types of overtraining called A-overtraining and B-overtraining. a) A-overtraining (Addisonic overtraining) is named after Addison’s disease and it is associated with diminished activity of the adrenal glands, which prepare muscle for physical activity in the face of stress. This is difficult to detect early because of the absence of any dramatic symptoms. This is usually not diagnosed until a decrease in performance happens. b) B-overtraining (Basedowic overtraining) is named after Basedow’s disease, which is associated with thyroid hyperactivity, affecting internal stress management and metabolism. This is the classical type of overtraining with its abundance of symptoms. A natural response to increased workload is increased levels of stress hormones. During overtraining, an individual will create oddly high or low concentrations of several of these hormones. Much of the scientific literature on overtraining is based on aerobic activities, despite the fact that resistance exercise is a large component of many exercise programs. Because of various resistance training programs, chronic resistance exercise can result in differential responses to overtraining depending on whether either training volume or training intensity is excessive. The neuroendocrine system is a complex physiological entity that can influence many other systems. Neuroendocrine responses to high volume resistance exercise overtraining appear to be somewhat similar to overtraining for aerobic activities. On the other hand, excessive resistance training intensity produces a distinctly different neuroendocrine profile. As a result, some of the neuroendocrine characteristics often suggested as markers of overtraining may not be applicable to some overtraining scenarios. This hypothesis lacks consistency in individuals. Therefore, further research is needed to better understand the role of the hypothalamic-pituitary axis in OTS. Recently, other authors have recognized the “cytokine hypothesis” as the most attractive hypothesis that accounts for the observed neuro-endocrine-immune disregulation of OTS. As you can see from what has already been mentioned in this article, there is a wide array of variability of symptoms that fall under OTS, yet it is impressive to find one source for all of these. There are several families of cytokines and many different cytokines within a family. This article will refer primarily to the pro-inflammatory cytokines: interleukin-1ß (IL-1ß), tumor necrosis factor-α (TNF-α) and interleukin-6 (IL-6). These three have a natural and specific role in promoting inflammation in order to complete the healing process. This hypothesis proposes that because OTS is a response to excessive training/competing with insufficient time for rest and recovery, this results in some form of tissue trauma and associated chronic inflammation, with the resulting release of pro-inflammatory cytokines. These cytokines increase in the blood and are capable of accessing the central nervous system and stimulating specific brain areas, resulting in changing behaviors such as depression, loss of appetite, and sleep disturbances, etc. These behaviors are associated with OTS. Biochemically, cytokines are capable of increasing certain blood markers associated with OTS such as C-reactive protein and ferritin. In terms of athletes becoming more susceptible to infections and allergies, in an overtrained athlete, the immune system becomes more susceptible to viral or bacterial infections. This renders the individual susceptible to developing an infection, and genetically predisposed individuals may develop allergies. All three of the above conditions can affect an individual physically by decreasing performance. In a word: rest and try some recovery techniques. All of these symptoms create an adaptive type of response in the body such that they promote withdrawal from training and encourage rest in order for recovery to happen. How much rest? That is largely dependent on the individual. Some recovery techniques involve a massage, meditation, contrast baths, yoga, a nap, contrast showers, sauna and/or hydrotherapy. Try one, several or all recovery techniques. For some athletes, just as missing a day of training is not an option, neither should an athlete’s recovery be missed.